Toronto’s King and Queen Streets — where packed streetcars stop and wait behind one left-turning driver or someone taking forever to parallel-park — is one of North America’s greatest monuments to the natural superiority of motorists over everyone else. These streetcars are all Toronto has in the way of east-west transit through the very core of downtown, yet their operations are routinely strangled by quite small numbers of cars, running as slow as 6 km/hr (4 mi/hr) (!) during the peak in the most critical section. This for a service that carries the overwhelming majority of the people moving down the street. 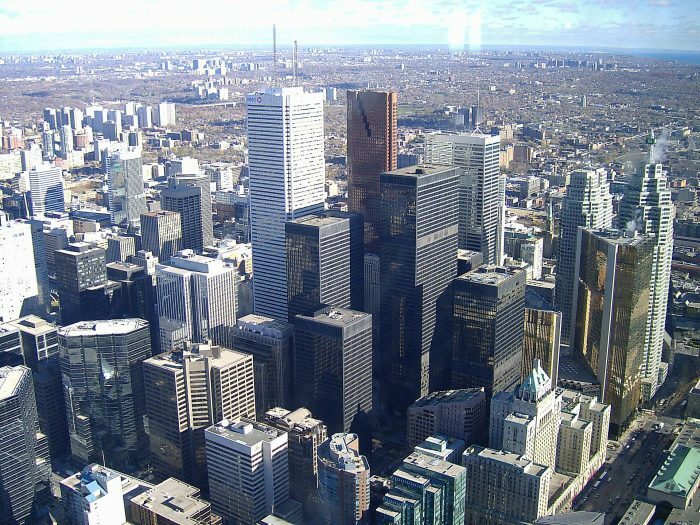 We’re talking about the middle of downtown Toronto, the city’s densest and fastest densifying area. For such a place to function, transit just as to succeed. We’re clear on how dense downtown Toronto is, right? The King streetcar connects this area to very dense residential areas to the east and west. Since this is Canada, you can be sure these are legacy streetcar lines. Almost nobody outside the US intentionally builds streetcars in mixed traffic, but many cities have inherited them. Long ago, they were reliable because there wasn’t much traffic. But things got worse in the usual boiling-frog manner, and now here we are. Now, the city is attempting the first step to improve things, by banning through traffic on King Street, one of the two key arteries. Oliver Moore has the story, which sounds like almost every story about a city trying to pry a little space away from the motorist so that anyone else can move. In few places, though, are the motorist’s claims to dominion so indefensible. The key change will be that cars will be forced right at every intersection, and left turns will be banned. There are still compromises: traffic is still in the streetcar’s lane, and refuges for passengers to board and alight will be marked only with paint. Yet the plan will still be controversial at Council, with some Councilors arguing that they have a geometrically incoherent “right” or “need” to drive cars anywhere in the city. This plan is a critical step, and deserves enthusiastic support. As a pilot, this could be changed for the better or watered down into something that “proves” transit priority does not work. What is a bit sad is that an interim design with block-long transit malls at transfer points to the subway was ditched because businesses objected to restriction on access. Politically, decisions on this type of change are controlled by the full City Council, not the portion of it only responsible for downtown, and there are far too many road-hogging suburban members on the larger body. It will be interesting to see whether the mayor, who talks a good line on transit, but fades at critical moments, ensures that his suburban pals support the pilot. A related problem is that the TTC could screw this up by failing to add service and properly manage the portion of the line outside of the pilot area. Time will tell. Don’t they use hook turns in Toronto as in Melbourne? That would keep the left turners out of the way of the tram (streetcar). No hook turns in TO. What we do have is provisions for U turns at select locations (protected) to eliminate the need for standard left turns at minor intersections. Well I can’t see the logic not using hook turns although in this particular case it does make it redundant if you get rid of cars completely. Some people hate them enough to do three right turns, or 3 left turns in Melbourne. I guess that’s the reason right there, just not a good one. While the concept is good, the illustration makes me think that better communication and design is needed for drivers to do what the plan aims for them to do. As designed, I foresee a lot of driver just going straight through, which is what happens a lot on Market Street in SF. Make the center through lanes at intersections some sort of rumble material that is very hard to drive a car over, and make the smooth asphalt divert people to the forced turn lane. Otherwise, this will be routinely ignored. In short, make following the law obvious and make breaking the law challenging. A similar concept was previously tried on King Street. Surprise, surprise, car drivers openly defied the law. Also not-so-surprising was that the Toronto police declared that enforcing the law was not their “priority.” So it failed. Steel and concrete is the way of enforcing this law. Needless to say, the Criminal Code of Canada does not approve of poisoning and killing people. Yet the Toronto police does not enforce the law in the face of these violent and dangerous criminals. Pity the dead. Glad to see this and hope Council follows through with it. you are not entirely correct that only the US is building streetcars in mixed used environments. Manchester, England has built a system with some sections seeing trams in mixed traffic. And a new line to Trafford Park will be similar. You are correct that none are being built in Canada. Personally, I don’t see the point of spending money to build lines in mixed traffic, when I bus can carry the same number of people and can move around obstructions (even trolley buses can do that). If only the people holding our (Tucson; yes, in mixed traffic) streetcar passengers hostage were even IN their cars! The frequent hangups for improperly parked vehicles along the route are more than maddening. Is the Tucson streetcar running curbside? 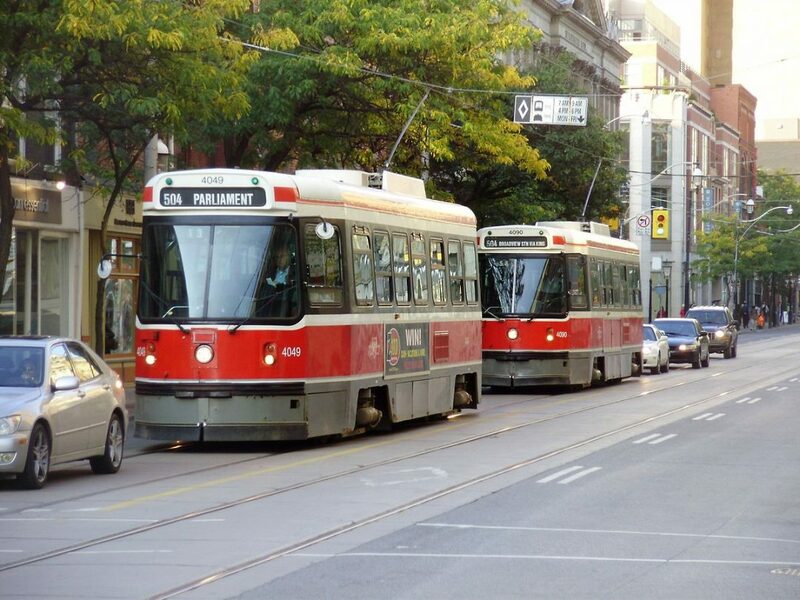 Toronto’s streetcars run in the centre lanes. It runs in the traffic lane, with two sets of tracks in the street, one in each direction. Cars stop behind it; it stops behind cars. Along some of the route there’s a second lane each way that cars can use also (streetcar is curbside) and in other parts of the route it’s just a two-lane road so one late is shared by streetcar and all the rest of traffic. Where there are two lanes in each direction the streetcar stops are located on the curb; where there’s just one lane in each direction they are in the middle. NHK World television has a series about Japanese railways called Japan Railway Journal. The May 11th episode, watchable online until May 25th, is about the Toden Arakawa line, the last surviving part of Tokyo’s tram network. The presenter says that most of the network was closed from 1967 onwards because road traffic was increasing and “the Toden network became one of the main reasons for traffic congestion” (i.e the trams *caused* congestion). He then goes on to say that the Arakawa line survived because most of the route was on its own right of way and so “its impact on traffic congestion was less of an issue”. What a great opportunity to both quantify and qualify what you’ve been writing about on this blog for years now. I hope the TTC is gathering good quality data, and we’ll all get an opportunity to see the findings – both positive and negative. It’s ironic that the above article says “transit riders will have to make due with buses”, because to me it really does feel like freedom. I’ve never been so happy to take transit in Toronto – what a massive difference it makes from where we live at the eastern terminus of the line! It might just be my imagination, but it seems the drivers are happier too (I know it’s a different department, so perhaps that’s the difference) – they certainly are more cordial and polite. They seem to enjoy driving at speed on the formerly pokey route (hold your hat folks! ); much much faster than the streetcar ever did. When I was dependent on the streetcar and had appointments on the other side of the city – even when my destination was on a subway line – I’d always book on a day when I could drive my husband to work and take the car from there. The unreliability of the streetcar meant I always had to add at least 1/2 hour to the estimated transit time to allow for delays, slow travel times, etc…, and the commute time required to take transit both ways ate up 1/2 the day. It just wasn’t worth it. The commute is still long, but now that it’s been replaced with buses I can actually depend on the printed schedule (hence the feeling of freedom). I’ve found myself saying – ‘that’s OK I can take the bus’ more times than not. And now I no longer feel the need to schedule car availability with my husband before committing to a time. A big shout out should go to TTC chair Josh Colle and Mayor Tory, and whomever else (TTC CEO Andy Byford as well, I’d imagine) was responsible for having the courage and foresight to make the decision to do this. I hope that this is a shot across the bow to test the waters for taking the streetcars out of mixed traffic on Queen, and giving the streetcars their own right-of-way on King in the downtown core. And I hope they’ll be generous sharing their data with transit professionals like you. I have written a series of articles on my blog delving into TTC’s vehicle tracking data and other factors in the bus vs streetcar comparison on Queen Street. For people living on the east end of the line, yes, they are generally seeing faster trips for a few reasons: (1) This part of the route is much less congested overall and traffic signals are spaced further apart. (2) The streetcar schedules have extra padding in them to offset worst case congestion and TTC operating practice is that streetcars drive slowly to keep to those padded running times. The buses do not, and drive at whatever speed they can achieve. Where the route is congested (in the core and on the west side of downtown), the buses operate at roughly the same speed as the streetcars. There are also far more buses (they are smaller and hence more are needed) and so wait times are shorter. Re the King Street project: On June 19 Toronto’s Executive Committee voted to ask staff to report on letting taxis operate with the same rules as transit vehicles rather than being forced to turn off of King Street with other traffic. This will have a big effect because there are a lot of taxis on King and they routinely flaunt rules about where and when they can park while awaiting fares. Another potential problem is that Uber “cabs” have no distinguishing feature, and if they’re allowed in, then anyone can drive as if they’re a “cab”. The suburban councillors who dominate the Executive Committee are having fits about the challenges of driving downtown. The whole package goes to Council in early July for approval, and implementation is planned for the fall. Detailed block-by-block designs have not been released yet and they will go through a round of consultation with stakeholder groups. It will be interesting to see how it is received and what difference it can make to travel times and reliability.